Mamiya is today famous for it's professional medium format cameras which provided generations of professional photographers with a more affordable alternative to Hasselblad. Mamiya is now part of Phase One, but Mamiya DNA can still be clearly seen in the current generation of Phase One cameras. But throughout the 50s, 60s, 70s and 80s Mamiya made a wide range of 35mm cameras too. Mamiya was never a major player in the 35mm market in the way there were in the medium format market, but they never-the-less produced a variety of very innovative and satisfying designs. When one of the minor camera makers wants to compete with the big boys, they can't rely on a cadre of loyal customers to sell their wears to. In order to compete they have to find a way to differentiate themselves from the majors, and this generally involves going on one of two directions: they must either compete on price; or they must innovate to give their cameras a 'unique selling point' (or U.S.P.) that the set-in-their-ways majors would never think of. Mamiya tried both approaches. They made many fairly boring SLRs that used M42 screw mount lenses that sold for much less than similar cameras from Pentax. But with the Auto XTL, launched in 1971, they tried their luck with the let's innovate the hell out of Nikon and Canon approach! So what made the Auto XTL so special? SLR cameras with automatic exposure were not new, but in 1971 they were still something of a novelty. Nikon, for example, didn't launch their first auto exposure SLR until 1977's Nikon FE. Another unusual feature was a choice of centre weighted average and 6% spot metering. The metering mode was set using a control to the left (as viewed by the photographer) of the lens mount, well placed for operation by the thumb. Most cameras in the 1970's had their light metering cells in the viewfinder, but the Auto XTL had a hinged flat metering cell right in front of the focal plane shutter, almost at the film plane. In theory this is the best place to see light as the film plane will see it. 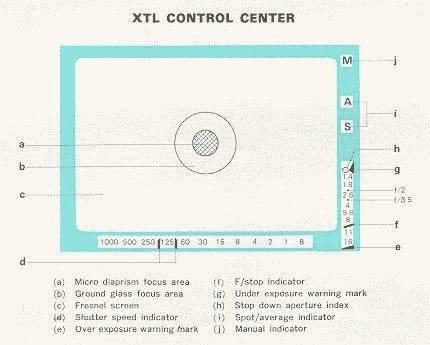 The Auto XTL's metering also had a large ASA range of 25-3200 and fairly wide range of measurable light values, from 3 to 18. Again, from from unique, but in comparison with most of Mamiya's second tier competitors a bayonet lens mount was definitely a selling point that allowed them to be seen as competing more directly with the big boys. Unfortunately Mamiya were never able to design a bayonet mount they could really stick with. Mamiya made sophisticated bayonet mount SLR cameras for a 13 year period from 1971 to 1982, and in that time 3 completely incompatible lens mounts! The Auto XTL features the Mamiya ES mount, which it shared only with the almost identical X-1000 camera. Mamiya called the Auto XTL's viewinder the 'XTL Control Center', and that wasn't just marketing hyperbole! The viewfinder has readouts for both shutter speed and aperture, and in manual mode, both the recommended and set aperture was shown so exposure could be set without removing your eye from the viewfinder. The viewfinder also showed metering mode and exposure mode. This extremely impressive, but was never-the-less somewhat ahead the the abilities of 1970s technology. This was all achieved long before the introduction of illuminated LED and LCD displays, so the readouts were all given using analogue needles illuminated using ambient light… a dark surroundings meant your readouts could almost completely disappear! The Auto XTL had all the other featured expected of a top-flight SLR camera. Fortunately the Auto XTL wasn't just a collection of I-bet-your-Nikon-doesn't-have-this features… it was a very well thought out design with great ergonomics. It had large, easy-to-turn dials and a variety of clear and well placed controls. I particularly like the way light metering is turned on and off. You switch metering on by pulling the wind-on lever out to it's stand-off position. When you do this a button at the wind-on lever turning point pop's up. You turn the metering off again by pushing this button back down. Having to set the wind-on lever to it's stand-off position to use a camera can cause problems for left-eyed people like me as the wind-on lever tends to poke your right eye. But on the XTL this doesn't isn't a problem for me. A very well designed adapter to allow the use of M42 screw mount lenses helped expand the lens selection somewhat, but a limited selection of lenses always hampered Mamiya's ability to complete with the big boys. (The best camera in the world is of limited use if you can't get the lenses you need!) But the lenses were interestingly designed with a focusing ring the flared out towards the end of the lens, which contributes to the over-all ergonomic excellence of the camera.